Paris Saint Germain winger Kylian Mbappe has lifted the lid on his relationship with club teammate Neymar, stating that the Brazilian is still the ‘leader’. Mbappe has enjoyed one hell of a ride over his last year as a professional footballer, swapping AS Monaco for French champions PSG, helping them retain the league title and then becoming a World Cup winner with France this July in Russia. The 19-year-old superstar has taken it all in his stride and displayed a level of composure that belies his tender age, which suggests that there could be even more to come from him as his career progresses. He won the young player of the tournament at the World Cup and even scored in the final, translating his electrifying form at club level onto the international stage seamlessly. 29 goals in 38 appearances during his first year in Paris earned him his call-up to Didier Deschamps French squad and he has already added another two goals to his tally with the Parisians after scoring a brace in their opening game of the new Ligue 1 season. 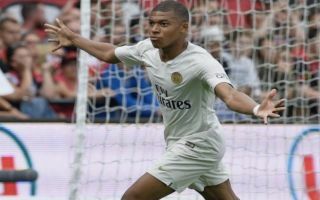 Many experts believe that Mbappe will soon usurp Neymar as the main man at PSG, but the young attacker has been quick to squash rumours of a rivalry between the two men, according to ESPN. He told reporters: “Our relationship is not going to change. Things are very clear between us and the manager confirmed it too. The Brazilian striker has been the target of a lot of criticism over the summer after his theatrics at the World Cup which many believe overshadowed his considerable footballing talents. Mbappe and Neymar’s fates remain intertwined for the time being and the only certainty is that it will be a joy to watch them both perform on the biggest stage in Europe once again this coming year.